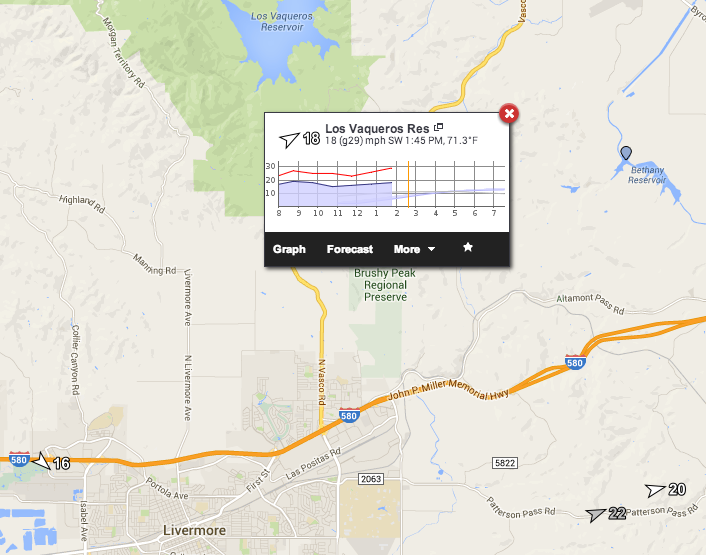 iWindsurf Community :: View topic - Best current Altamont Pass wind source? 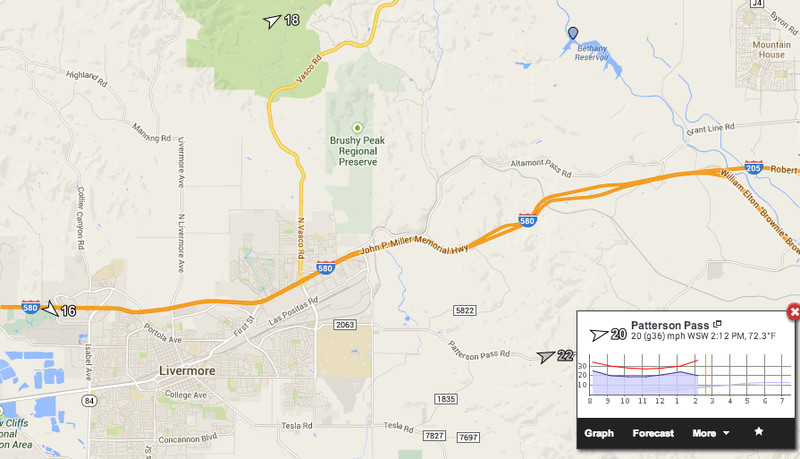 Best current Altamont Pass wind source? Posted: Mon Aug 25, 2014 3:59 pm Post subject: Best current Altamont Pass wind source? I'd like to check into jibe city, Bethany Reservoir this season, east of Livermore off of hwy 580. I've heard the best time to go depends on the Altamont Pass wind readings, probably associated with the wind mills. Is the Livermore reading on this site accurate for Bethany or does anyone know of a more accurate source? So far, I can't find one. Thanks. Don't ding your boards on the rocks launching and landing. Don't let the wind blow your boards off the parking lot. Don't get caught in the fishing lines. Well thank you Lee. I've been crawling up and down rip rap from Berkeley, to TI to San Bruno Point, etc. for years, even when it's actually windy. You do make a good contrast to George who's actually helpful and positive. Doh. Byron airport has an automated weather reporting system. Old school. You can call in and hear the recording. Dont have the number handy. I've sailed there since around 1989. My bud, who lived on Vasco Rd., and is named that, has logged well over 300 days there. He's currently living at the foot of McLaren Park and sails mostly the stick. I've heard of Bethany as a windsurfing spot since 1985. Thanks cruzanboard. Just moved to San Ramon from the Peninsula. Used to live 5 minutes from Coyote. Exploring all options for a quick sail. I'll try to report back if/when I get a sess at Bethany. I've sailed many a sess at Oyster and it's 200 yard runs. Sounds like Bethany is similar but with more wind. there's more than rocks and fishing lines to worry about. Hey George, while the thread is fresh, where did you launch from and or sail? Upper lake, lower down?? Thanks.